Hessonite (Gomed) is found in light to deep brownish yellow or red colors. It resembles the color of cows’ urine or honey. Hessonite is a variety of Grossularite Garnet. Keeping its strength and importance, Rahu has been given the status of a planet in Vedic Astrology though it does not have any physical existence. In astrology, gem stones are recommended on the basis of placement of planets in a horoscope. Rahu is considered a malefic planet and makes its natives defiant, irresponsible and secretive. Rahu is energetic but disruptive. He disturbs the psychological make-up of the natives and creates confusion in the minds. All these are the qualities of a shadow planet as it does not have physical body and it is also always in retrograde position. Rahu denotes intellect, wickedness, confusion and mental capacity in terms of cheating and destructive manners of an individual. Hessonite (Gomed) governs this planet. Rahu and is said to be exalted in Taurus sign. Rahu, the North Node or the Dragon's Head, is known as the ascending node, because it marks the point where the Moon crosses the ecliptic from southern to northern celestial latitudes. Rahu is also considered ruler of instant profit and sudden results. Rahu in general indicates travelling, harsh speech, gambling, thugs, cheats, out castes, foreigners, paternal grandfather, reptiles, snakes, theft, wickedness and widows. Rahu with its enemies planets like Sun, Mars and Saturn gives most malefic results. Negative Rahu also causes lack of concentration and insomnia etc. Malefic aspects on Rahu give more severe results. The dasha of Rahu runs for a period of 18 years where the native is tested, rewarded or punished as per one's Karma. In family relations, this signifies grandfather. This planet also governs the wit of a person. Powerful Rahu blesses the person with success in political life due to his cleverness and courage. Hessonite should be worn if Rahu is giving weak or malefic results in the chart. Hessonite (Gomed) ensures relief from the malefic effect from Rahu. It clears the confusion in mind and gives stability in life and enhances positive energy of Rahu. If Rahu is weak by placement in the chart or is in debilitated state or is in enemy sign, the desired results of Rahu as well as the house it denotes cannot be expected. The person suffers from instability, depression and failures. He can also be a liar and cheat. Rahu ring is useful to those who want to get success in law practice, court affairs, political spheres, travel agents, and to achieve the ability to win at gambling. Enemies can't stand longer before the wearer of Rahu ring. It also removes fear, creates clarity of mind, and helps spiritual growth. Black Magic cannot affect one who wears this ring. One is safe from the fear of snakes and snake bites, accidents and injuries. Gomed removes obstacles and brings favour from the government and government agencies. It also overcomes suspicious nature and mind and cures various skin problems, phobias, effect of poisons, insanity etc. Gems affect the subtle energy field of human being. (To understand subtle energy, see our article Theory of Subtle Energy). Our energy and thought process and accordingly the actions (karmas) are governed by this subtle energy. If malefic planets are posited with Rahu, or Rahu is placed in 6th, 8th or 12th house of a chart, Gomed should be worn. But finally before wearing this gem, the horoscope should be got analyzed by learned Astrologer. Hessonite is extremely beneficial for the students of politics. Hessonite should be worn by politicians, businessmen and by those who have public contacts. Negative, malefic or weak Rahu denotes many diseases like asthma, insanity, mental disorder, epilepsy, weak mind, stomach problems leprosy and insomnia etc. It also signifies the diseases which are difficult to diagnose. Placed with Moon it develops tendency to commit suicide. By wearing Hessonite gemstone, a man can overcome these problems along with mental disorders and obsessive disorders, if any. Gomed gem is worn to enable one to exhaust the wheel of karmic desires. By achieving this state soul start heading towards higher spiritual worlds. Hessonite may be embedded in Silver and ring should be worn on Saturday morning (Shukla Paksha) after dipping the ring in Gangajal or un-boiled milk and energizing the Gem with the prescribed mantras. 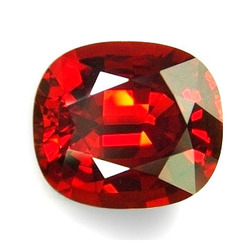 Hessonite is considered a cold gem by nature.